Shoppers in downtown Boston found an elegant, updated retail experience when the flagship store and headquarters for Filene’s Department Store opened in 1912. 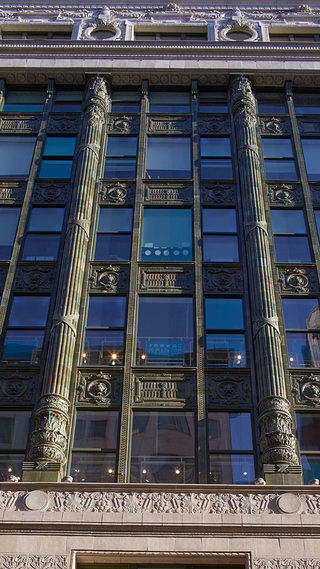 The eight-story, Beaux Arts-style building was the final design of Chicago architect Daniel Burnham, who died months before its completion. After Filene’s merged with Macy’s in 2006, the building was vacated, and its next owners gutted the interior. Developer Millennium Partners took over in 2012 and hired New York–based Handel Architects and Building Conservation Associates to restore the National Register–listed building. The team reinforced the steel frame; added modernized systems; converted upper floors into office space; restored the terra-cotta facade; and re-created the original cast-iron and glass canopies, which had been removed during a 1960s renovation. The building reopened last summer as a mixed-use office and retail complex. Tenants include a clothing store, a specialty grocery store, and an advertising and creative agency.